The first effective fire extinguisher was invented in 1813 by a man named George William Manby who saw that fire departments had difficulty fighting fires above the first floor of buildings because the old fashioned hoses simply didn’t reach high enough. To solve the problem he took a 4 gallon tank and added compressed air that when the air was released pushed the water out of the spout of the tank allowing firemen to have portable water tanks to fight floors on second stories and higher. While this first fire extinguisher didn’t solve every problem it did make fire fighting more effective. Like all great inventions over the years many other people made improvements to the original fire extinguisher making them more effective and useful. One of the first improvements to Manby’s fire extinguisher occurred in 1866 when Francois Carlier used bicarbonate soda mixed with tartaric acid in place of compressed air as the propellant for the water. By 1905 Aluminum sulfate replaced the tartaric acid with aluminum sulfate mixed with bicarbonate soda as the propellant for the water. Still more recently improvements in fire extinguishers resulted in extinguisher having an inner cartridge of carbon dioxide that acts as the pressurizing agent which forces the extinguishing agent out of the extinguisher. As fire Extinguishers improved so did the extinguishing agents. Since not all fires respond favorable to having water applied fire extinguisher inventors developed fire extinguishing agents made from foams or powder that smothered the fire. These powder and foam extinguishers work better on grease and gas fires that can actually be spread by water. 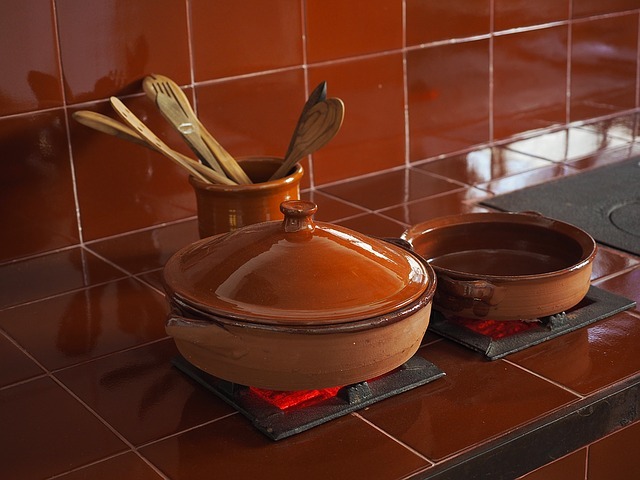 While the first fire extinguishers were made for use by firefighters in the performance of their jobs, today fire extinguishers appear in homes and businesses. Changes in safety regulations actually require fire extinguishers to be used in businesses, homes, on boats and even on aircraft. In order to keeping your fire extinguisher in good working condition, it should be inspected at least monthly. While fire extinguishers do increase the safety during fires and allow for home and business owners, those on boats and the personnel on planes to put out small fires before they grow into larger fires these extinguishers can pose some dangers of their own. For one thing most modern day fire extinguishers are under pressure, should these extinguishers become punctured or overheated (over 120 degrees Fahrenheit) they can explode causing injury to anyone close by. In addition, depending on what fire-extinguishing agent is contained in your extinguishers, the agent itself can cause burns to the skin and eye irritations. Even those fire-extinguishing agents that are considered to be safe to skin and eyes can cause damage if directly sprayed in the face with the agent. One of the newest advances in fire extinguishers is a lightweight single use fire extinguisher that uses a non-pressurized delivery system. 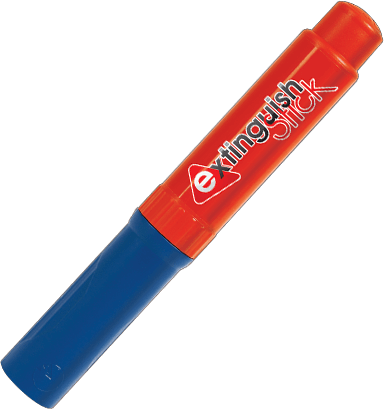 Called the “ Extinguish Stick “ this extinguisher weighs only about 16 ounces can be stored in small places like the glove compartment of your car, and doesn’t leave behind any residue that can affect the surfaces it lands on making it safe to use around just about any electronic device or kitchen appliance. This newest extinguisher can also be used in almost any business from auto shops to aeronautics. 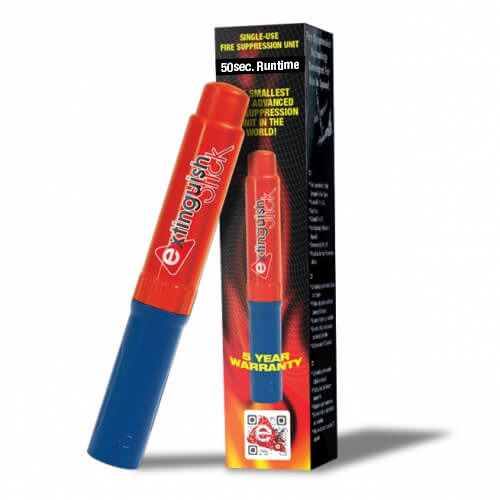 It’s Not Pressurized- Since the Extinguish Sticks fire treating agent is not under pressure you don’t have to worry about it exploding in higher temperatures or should the stick become punctured. This means this fire extinguisher isn’t only safe when a fire breaks out, but is safer when simply sitting around your home or business. Doesn’t Need Maintenance- Unlike more traditional fire extinguishers that need to be checked and maintained from the time to time the Extinguish Stick never needs maintenance so it is effective whenever and where ever you need it. Environmentally Friendly- Not only does the Extinguish Stick not corrode surfaces when putting out a fire, it also can be used around both salt and fresh water without worrying about it polluting the environment. From the first portable fire extinguishers that weight 4 pounds, to the Extinguish Stick that weighs only about a pound, the history of fire extinguishers and how they have changed over the years is fascinating and interesting.